I am compensated by Keurig® for sharing my view; all opinions remain 100% my own. You guys I can honestly admit that I am not my best self in the morning. For one, I have always had a hard time waking up early and two I am seriously so ungraceful. I can’t hold a decent conversation for at least an hour and I go into this weird cleaning mode if the house was dirty from the night before. I’m working on it, okay?! Does anyone else have this problem? Since we moved into our new house I have been even worse! I naturally just want the house to be in perfect shape but we all know it takes months and months for that to happen after a move. Daylight savings is something I always look forward to because who doesn’t love an extra hour in the morning? 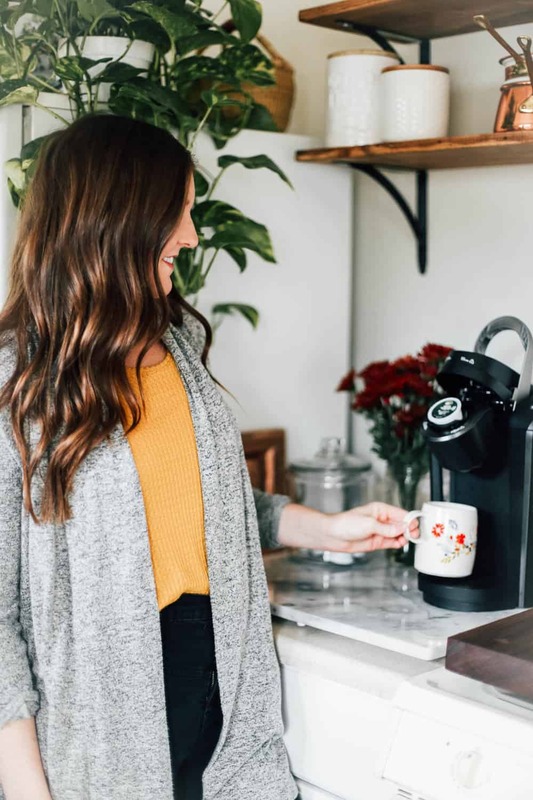 And this year, I am even more excited because I’m partnering with Keurig® to take pause and bring a little a love back into our morning by participating in their #BrewTheLove challenge. 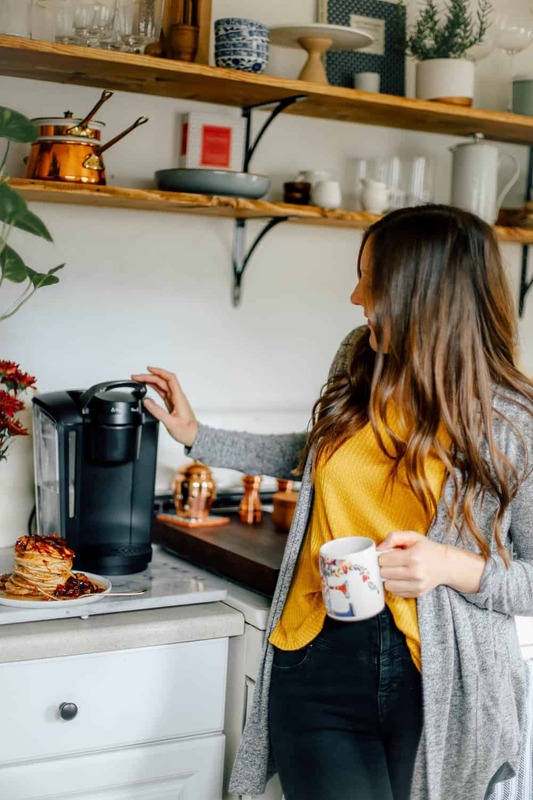 This year, Keurig® is encouraging everyone to take the extra morning hour to spread some joy and happiness and I gladly accepted their challenge because I really needed to relax and try to enjoy my morning with my husband instead of fight it. 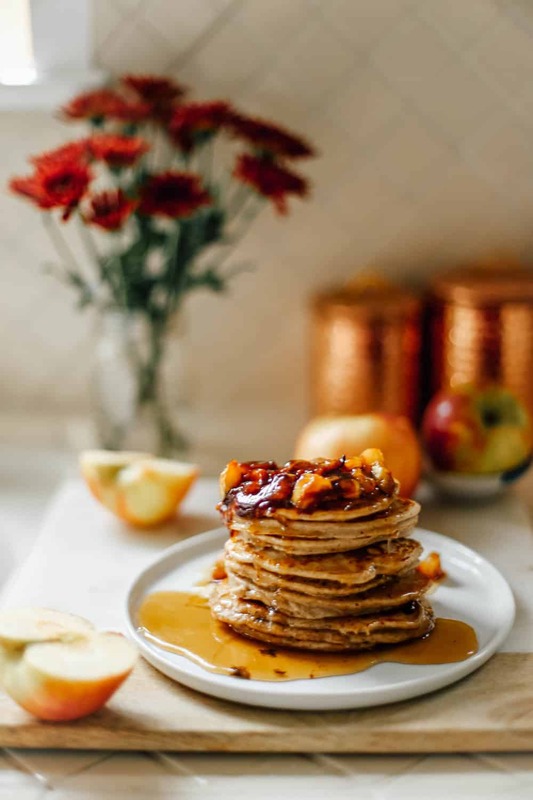 All good mornings start with pancakes right?! I told myself that I was going to wake up and just relax this morning, and I did! The morning started off with a steamy cup of Green Mountain Coffee®. If Jared takes one sip of my coffee he instantly knows it’s mine. I like my coffee super sweet and creamy. Our new Keurig® K-Select™ coffee maker is great for both of us because while I like my coffee sweet, he can make a bold cup of black coffee with the “Strong” button. Afterwards, we each get our favorite cup, our favorite way. I threw on my cozy sweater and got started on some fall-flavored pancakes. I remember growing up I was always instantly happier when we got morning apple fritters from our local doughnut shop. 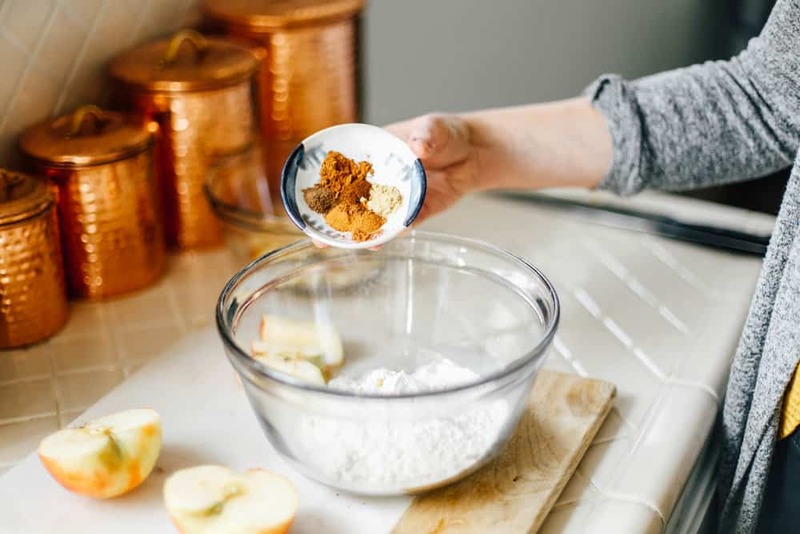 These apple chai cider pancakes are basically an apple fritter doughnut in pancake form. They’re delish and FULL of fall flavor! I packed them full of chai spices, apple cider and on top is the most decadent browned maple butter with caramelized apples. I knew that these pancakes would certainly make our morning memorable. I wanted to make an especially nice breakfast for Jared, seeing as he is the one that has to deal with ‘morning me’. His favorite snack is an apple. Not kidding, give that man an apple and peanut butter and he is happy as a clam. I knew apple pancakes would hit the spot for him. 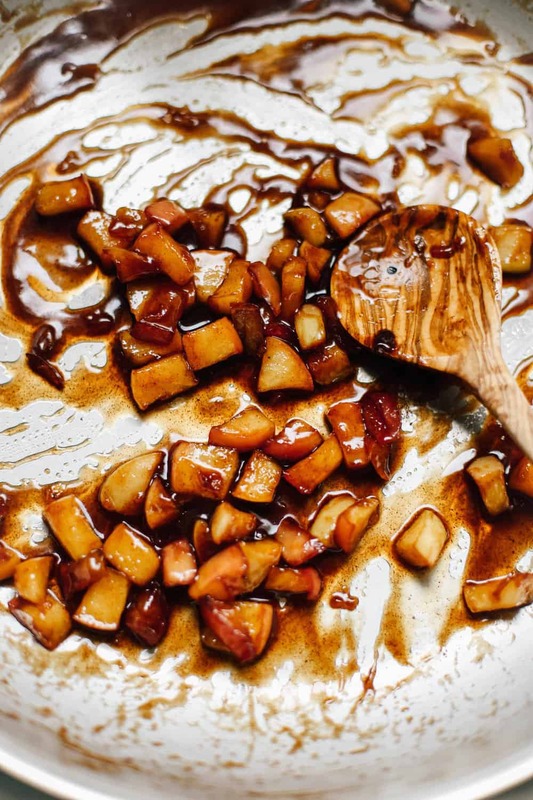 My favorite part is not the chai flavoring or the caramelized apples but the super decadent browned butter on top. I would seriously eat 9/10 foods if browned butter was on them. 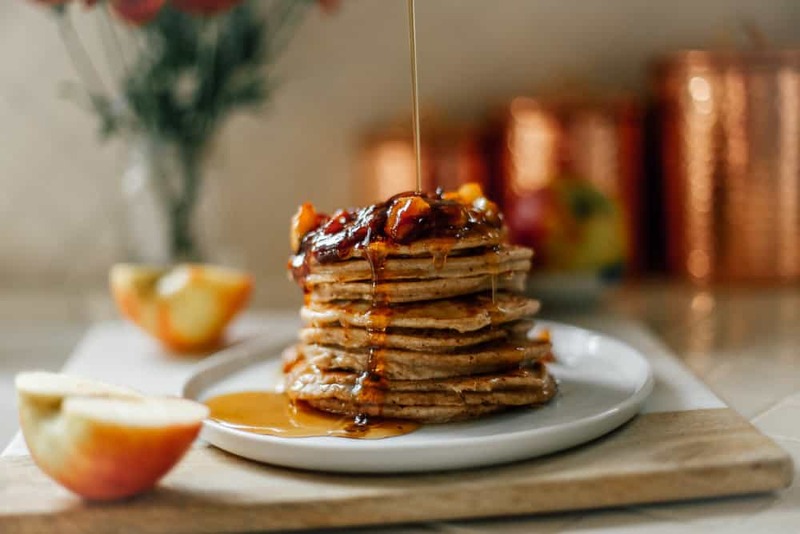 I really hope that you guys not only make your own apple chai cider pancakes this morning but that you will also #BrewTheLove for fall back day. 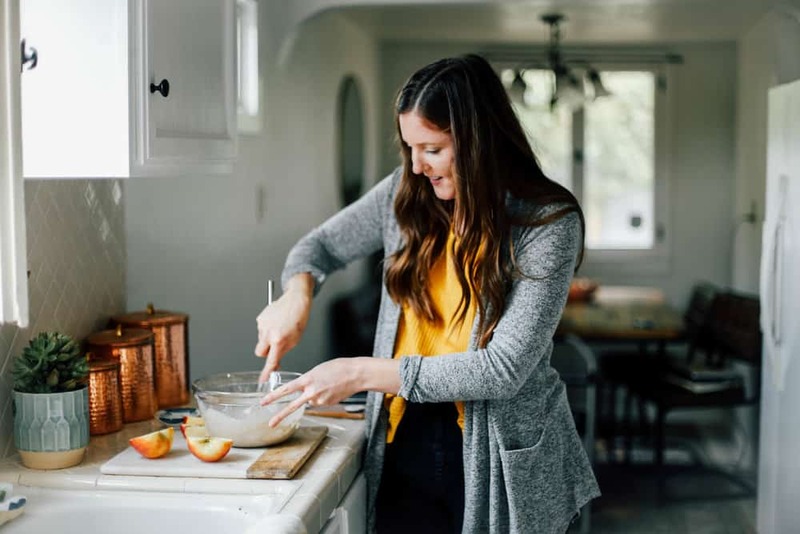 Below I have a running list of fun ideas that you can mix and choose from to make the most of your extra hour and take the challenge this morning. 2. Get outside and build yourself a small upright herb garden, perfect for thanksgiving cooking coming up! 10. Call up a friend you haven’t chatted with for a while and catch up with virtual coffee date! In a small sauce pot heat stick of butter on medium heat until melted and browned. Be careful not to BURN butter, this process usually takes 5-10 minutes. Away from heat add in maple syrup and cinnamon. You will want the butter to be golden amber in color. Let butter cool completely. With an electric mixer or hand whisk, beat butter for 1-2 minutes or until fluffy. In a large bowl whisk together dry pancake ingredients: flour, baking powder, salt and spices. In a medium bowl add in melted butter, cider, milk, honey and egg and mix together. Add wet ingredients to dry ingredients and whisk until just combined and lumpy. In a small saute pan add apples, butter, cinnamon and brown sugar. Cook for 5-10 minutes on medium heat until apples have caramelized and softened. Heat a pancake pan or large griddle on medium heat with melted butter. Pour 1/4 cup servings of batter into pan and cook until air bubbles have popped and stayed popped. Flip pancake and continue to cook for an additional minute. Serve with browned maple butter, caramelized apples and maple syrup. Next Post Butternut Squash Ravioli with Chipotle Sage Masala Sauce & Our trip to Verona! Hi Hillary! I’m so happy you liked them!